Background: Little is known about factors contributing to children’s asthma control status and health-related quality of life (HRQoL). The study objectives were to assess the relationship between asthma control and asthmaspecific HRQoL in asthmatic children, and to examine the extent to which parental health literacy, perceived selfefficacy with patient-physician interaction, and satisfaction with shared decision-making (SDM) contribute to children’s asthma control and asthma-specific HRQoL. Methods: This cross-sectional study utilized data collected from a sample of asthmatic children (n = 160) aged 8–17 years and their parents (n = 160) who visited a university medical center. Asthma-specific HRQoL was selfreported by children using the National Institutes of Health’s Patient-Reported Outcomes Measurement Information System (PROMIS) Pediatric Asthma Impact Scale. Satisfaction with SDM, perceived self-efficacy with patient-physician interaction, parental health literacy, and asthma control were reported by parents using standardized measures. Structural equation modeling (SEM) was performed to test the hypothesized pathways. Results: Path analysis revealed that children with better asthma control reported higher asthma-specific HRQoL (β = 0.4, P < 0.001). Parents with higher health literacy and greater perceived self-efficacy with patient-physician interactions were associated with higher satisfaction with SDM (β = 0.38, P < 0.05; β = 0.58, P < 0.001, respectively). Greater satisfaction with SDM was in turn associated with better asthma control (β = −0.26, P < 0.01). Conclusion: Children’s asthma control status influenced their asthma-specific HRQoL. However, parental factors such as perceived self-efficacy with patient-physician interaction and satisfaction with shared decision-making indirectly influenced children’s asthma control status and asthma-specific HRQoL. Keywords: Asthma control, Health-related quality of life, PROMIS, Satisfaction with shared decision-making, Perceived self-efficacy with patient-physician interaction, Structural equation modeling. doi:10.1186/1465-9921-14-26 Cite this article as: Gandhi et al. 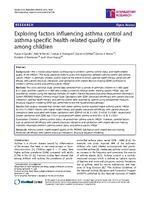 : Exploring factors influencing asthma control and asthma-specific health-related quality of life among children. Respiratory Research 2013 14:26.